During Bundled Payments for Post-Acute Care: Four Critical Paths To Success, a 45-minute webinar on July 22nd at 1:30 p.m. Eastern, Debbie Reber, MHS, OTR, vice president of clinical services, Brooks Rehabilitation, will share the inside details on these four domains and the resulting, significant savings that Brook achieved through the BPCI program. You can "attend" this program right in your office. It's so convenient! Invite your staff members to participate in the conference. We will send you a login to access the webinar or a DVD or CD-ROM of the conference proceedings once it's available for shipping. You'll also have the opportunity to have all of your questions answered by Debbie Reber during the interactive question and answer session. 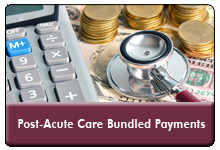 You'll get answers to your questions and challenges on bundling payments for post-acute care.